How much does it cost to go to the doctor in China? How much does it cost to see a doctor in China? Well the basic consultation fees may be cheap at just 20 yuan or so, but figures released by the health department of Dongguan in Guangdong show that the average cost of a hospital clinic visit is about 155 yuan (US$25). The average cost of clinic visits per person in a year was 530 yuan ($85). Bear in mind that most people with an illness in China go direct to hospital, where they will register and wait several hours to see a doctor for just a few minutes. No wonder they call it kan bing nan, kan bing gui (看病难, 看病贵 Difficult to see a Doctor, Expensive to see a Doctor). The figures released by the Dongguan health department also show how much you might expect to pay for inpatient treatment. At this medium level city in an affluent part of China a public hospital bed will cost you 910 yuan a day (US147). The report says that the average costs per person per year of hospital treatment overall were 7820 yuan ($1260). These costs were lower than the average for larger hospitals in cities such as Guangzhou, where a hospital clinic treatment would cost 250 yuan ($40) and an average hospital stay might be as much as 14,000 yuan ($2250). These are the upfront costs for hospital treatment. Many people will be covered by some kind of basic national health insurance. Typically this might cover 30% of outpatient clinic costs and up to 70% of inpatient costs. 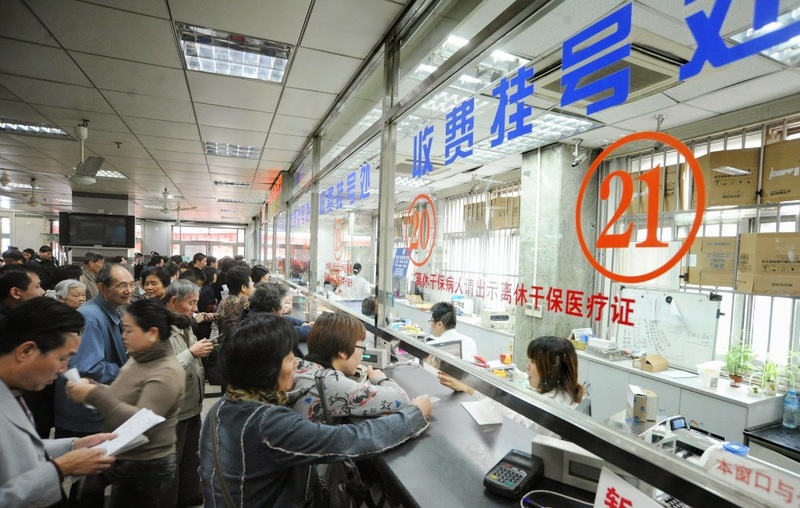 This means that a patient might face a 'gap fee' of 100 yuan per clinic visit and 300 yuan per day in hospital. However, like health insurance schemes everywhere there are major restrictions on eligibility, procedures covered and 'caps' on reimbursement. Some people questioned the high costs put out by the health department, saying they were not the fees they expected to pay for visiting a clinic for a cold or fever. However, the department said they were average costs, based on hospital finance department figures, and included costs of medicines and other services. For some patients undergoing procedures such as surgery, they could be much higher, raising the average. They said they fees were higher at tertiary level hospitals and they had released the figures to show that it would be much cheaper for people to seek treatment for minor illnesses at community level "general practitioner" clinics. For comparison, a mainland Chinese reporter went to Hong Kong to see how much it cost to see a doctor there. They found that in public hospitals the doctor consultation fees were a nominal 50HKD (40 yuan) and the costs of an inpatient stay was 100 HKD per day (80 yuan), including all food. There were very few queues. Locals said they preferred to go to local GP clinics for minor illnesses, or a private GP clinic, where the cost of a consultation was a modest 100HKD, rather than hospitals, which were for more serious illness. ICICI Pru Smart kid Assure Plan. Max Life Shiksha Plus Super. Birla Sun Life Insurance Vision Star Plan.